Diwali means different things to different people all over India. People worship different Hindu Gods, have different customs to observe the religious importance of the day. Famously known as festival of lights, for me it is exactly that. A festival of light, happiness, joy, sweets and togetherness. The whole country switches off to the festive mood, shopping splurges, cleaning up the house, buying gold, long cues at the famous mithai walas ( sweet sellers), gifts and proudly dressed up kids to show off there diwali dress. Even if you a not celebrating Diwali for the religious purpose, no one can resist the joy and over whelming festivity this festival brings. Here, in Kuwait, the celebrations are not as vivid ofcourse but it still doesn't stop me from making sweets. Indians desserts have one ground rule: Anything that can go in milk or milk products and sugar can come out tasting like heaven.Which I just made up but I can assure you its true. Halwa is an Indian dessert made with full fat milk/milk product, sugar, nuts and ocassionaly spices with one key ingredient. The key ingredient is like bollywood hero. And all other ingredient are like villains and some are just supporting actors. Let me explain what I meant. See, most of the halwa's start with healthy key ingredient like carrot, bottle-gourd, apple, pineapple, beetroot, lentils, sabodana etc. They are good, healthy, honest, good for you Indian hero. And there are villians, full fat milk, sometimes milk powders, khoya/mawa and sugar. And then there are supporting actors who make the whole thing complete - spices and nuts. I don't know how you feel about bollywood, but if you have sweet tooth and are yet to taste aIndian halwas, you are missing out on something very special. 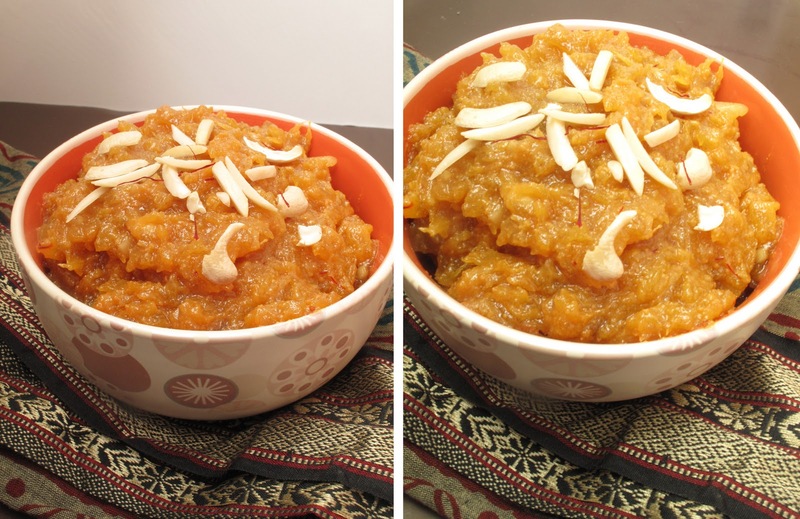 Halwas are very versatile and you can make halwa out of almost anything sweet you fancy. Depending on the texture of your key ingredient the method and cooking may vary. If you are making a halwa with lentils such as moong dal it would take more time than say a pineapple halwa. They all taste different and the humble key ingredient turns into something divine. That said, its not a very waist friendly recipe, but hey remember " food to eat, legs to run" ! Considering the feedback received on the recipe, I think its better to start with about 1/4 of sugar and level it up according to sweetness preferred. Also, since these are photos taken with flash, the mawa in picture looks darker than it is supposed to me. You should look for a creamish color and switch of the flame at that point. *Indian halwa use khoya/mawa which is nothing but dry solid milk which is made by heating milk for hours and hours. In India, fresh khoya is readily available at stores. So Indians like us who live away from home try to find substitution for khoya. One of the commonly used substitution is milk powder which works extremely well. I use milk powder extensively in Indian sweets ranging from gulab jamun, ras malai to halwas. But in each sweet, the way it’s used differs. For most if not all my halwas, I make mawa using this method and trust me its taste just like the real stuff. 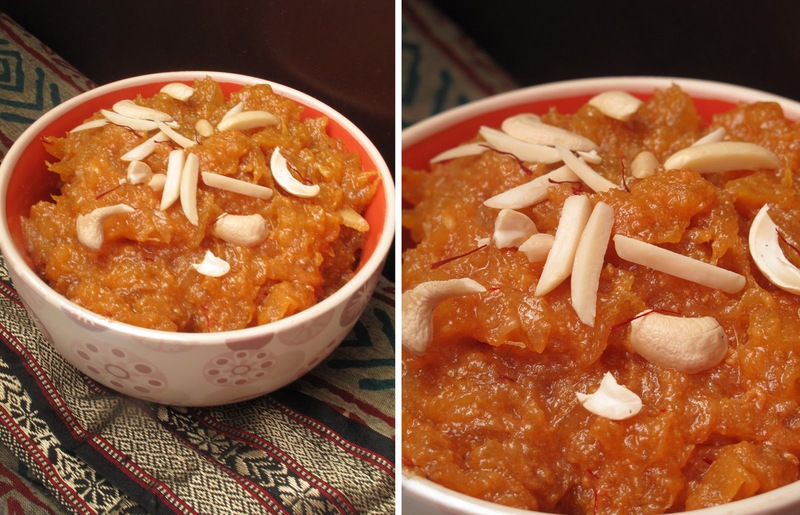 **I don’t use canned fruits specially in syrup but for this halwa canned works particularly well. In fact I prefer it over fresh pineapple. If you are using fresh pineapple the cooking time will be longer and adjust sugar according to the sweetness of the fruit. Okay. Listen don’t jump from here. You need to read this particularly well. This is so easy and you shall be so proud of yourself once you get it right. Heat the ghee in non sticking frying pan. Heat the ghee and then switch off the gas. Let it cool a bit and then add your milk powder. Mix. Put it back on the stove at low heat. Looks like this. For the first 5 minutes it will feel like nothing’s happening. All through out you have to keep moving it around to make sure nothing sticks. After 5 minutes, you will notice that its slowly changing color. It’s a subtle change. And thinks will work fast from here so don'tt stop stirring it around. After 10 minutes, you will notice the color had gone slightly more dark. Keep a bowl of water with you. Splash/sprinkle in some water. The mixture will start granulating like this. Keep sprinkling water till you see it starts leaving ghee. Gradually most of the ghee will separate from it. Drain off the ghee. This is the stuff that makes this halwa out of world. Yeah I know that sounds very cheesy. But when did I say I got writing skills? Chop them finely. In a deep bottom saucerpan add the pineapples with sugar. Let it cook for 15-20 minutes or till you see the pineapple has almost cooked in sugar. Add the mawa and mix. Add saffron dissolved in milk, almonds, cashew and raisins. Now I hear the halwa overload! never made pineapple halwa. sounds scrumptious! For me all sweets are villians in disguise :) Actually superheros for tongue & villans for waist! This halwa looks yum..I did not try fruits in halwa anytimeI love your saree/scarf on the background! Happy Diwali to you and your family dear! Great pics Kulsum! Happy Diwali!! Happy Diwali Kulsum! I can't think of a better way to celebrate than to have halwa. You are an amazing cook, this looks divine. Thank you friends for dropping by and all your lovely wishes. This certainly was a delicious and sinful bowl of halwa. That look sbeautiful kulsum....i love pineapple flavours and i guess i shud give this a go too:)....love ur blog! It looks so hearty and flavorful! Hey first time here kulsum.. totally I am loving ur space and the halwa looks so delicious that I can have the whole bowl. Lovely !!! I'm so glad I stumbled upon your blog!! My boyfriend and I take out Indian at least twice a week and I've always wondered if I could make it myself... I'm having so much fun going through your recipes! Kulsum,when I was working with an Indian restaurant sometime back,we used to make this halwa using semolina and pineapple juice.Very similar to sooji halwa,but pineapple juice used to be added instead of milk/water,along with some yellow color for a better appearance. Kulsum, awesome recipe. I ate some on my last visit to India and have been searching for a simple recipe since then. - thank you ! Thank you !! i use condensed milk to make my halwas. tastes just as divine. and pineapple halwa is my absolute favourite. I finally got a chance to check out your website!! Great stuff!! :) I still cant believe it done by YOU!! hehe..